The Mop and Broom organizer is amazing I always had trouble getting the mop, broom, duster in the closet and staying there there with out hitting me when I open it to get some thing else out of there. This was easy to put up as soon as I got my husband to do it. There are rubber grips in there that hold on to the broom so it will not go anywhere. You can adjust them if you want them higher or lower. 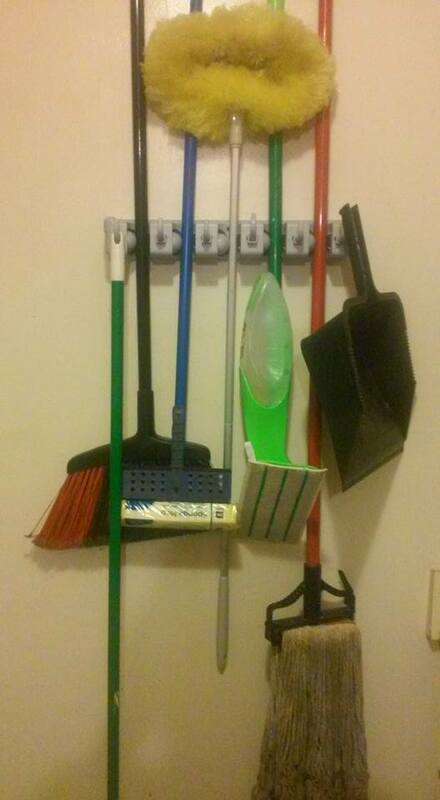 You can also hang your dust pan and hand broom on there as well they have little hooks that come out and fold back in. This is amazing product and I LOVE it. Come get your Mop and Broom Organizer today.